This is one of those books that feels really big even though the actual scope is only as wide as a single family, and in this case not even a very big family. It's the themes that make it feel sweeping, as well as the span of years it covers, following trails of heartbreak from one generation to the next. The story begins in 1938 with plucky, naïve Eveline, who has moved into a cabin nestled deep in the Minnesota woods to be with her husband, German immigrant Emil. Although Eveline is a city girl, she proves her mettle with how quickly she adapts to her new hardscrabble country life. It's that inner toughness, that grit that leads her to stay on alone when Emil is called back to Germany to visit his dying father. She subsists just fine—chopping her own wood, caring for their young son Hux, even taking over Emil's taxidermy business to make money while he's away. However, despite Eveline's resourcefulness, there are some tragedies that can't be avoided, and one unwelcome visitor changes everything. Eveline is forced to make an impossible choice, one that will reverberate through her family for generations to come. The story picks back up in 1954, 1961, and 1972, and each section reveals how the past continues to live in the characters' present. Redemption may not come in just one generation; it may not come at all. 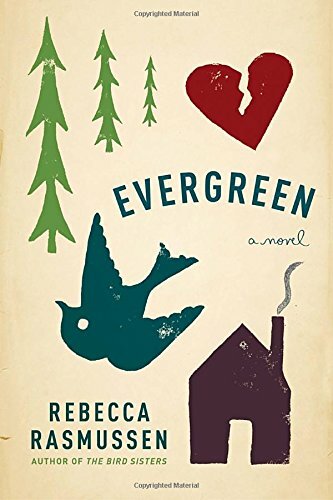 But the name of the place Emil chose to live all those years ago—Evergreen—is a symbol of the hope and promise the future holds, even after unimaginable pain and loss. I loved Eveline, the calm and matter-of-fact way she takes care of business. She's one of the most memorable strong female characters I've read in a while. I was almost disappointed when the story moved on from her, although I came to love the entire cast: Eveline's wacky but loving friend Lulu, plainspoken and deeply honest Hux, and fragile, feral Naamah. Rasmussen captures perfectly the duality, the bittersweetness of their lives. Their joy (like all joy?) is inextricably entwined with their sorrows. TagsThe Natural World, Mamas and Papas, Abandonment Issues, Dysfunctional Families, [Non-Icelandic] Sagas, Baby Mama Drama, Bittersweet Life, Choices With Far-Reaching Consequences, Keeping Secrets, Sweet Solitude, You Think Your Childhood Was Screwed Up?